Live blog on RTÉ.ie and the RTÉ News Now App from on Saturday at 6.30pm and Sunday from 1.30pm. Live commentaries on RTÉ Radio 1 Saturday Sport Extra at 6.55pm and Sunday Sport from 2pm. Tipp's Saturday night clash with Clare is live on eir Sport 1 and also available with GAAGO, at 7pm. On Sunday Wexford v Limerick is live with GAAGO - and there is deferred coverage of on TG4, 2.30pm, after Monaghan v Dublin. TV highlights of all the weekend's action on Allianz League Sunday on RTÉ2 and the RTÉ Player on Sunday 9.30pm. It's no ordinary league campaign. This year, no one can be relegated from Division 1A due to a change to the format that will see the top two tiers mixed and matched into two groups of six in 2020. With the last two All-Ireland winners - Limerick and Galway - both coming from 1B, the argument that the intensely competitive nature of 1A was unfairly taxing grew such momentum that action was taken. We find ourselves in a sort of limbo. That's not to say that this will be an extended pre-season stretch of the legs. There are too many sub-plots and contexts at play for those in the highest division to go through the motions. Liam Sheedy is back at the helm in Tipperary and is targeting a strong spring to launch the Premier into Munster. They've lost the last two league deciders, to Kilkenny last year and Galway twelve months before that. 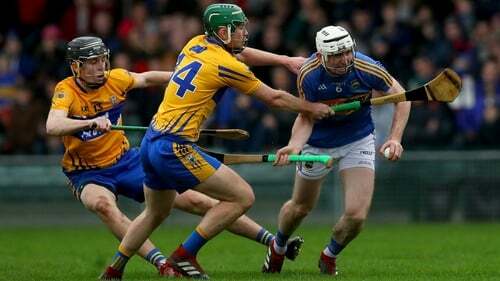 They also come into their curtain-raiser against Clare looking to halt a three-game losing run against the Banner. It's only two weeks since Tipp were turned over by Clare 4-19 to 1-18 in the Munster Hurling League final and although that pre-season humbling will be soon forgotten once the real business starts, it would have stung them sufficiently to give Saturday night's opener a nice edge. All-Ireland champions Limerick head to Davy Fitzgerald's Wexford on Sunday, Joh Kiely naming 11 of their All-Ireland final starting team. With Kyle Hayes and Mike Casey both injured and Graeme Mulcahy and Darragh O'Donovan on the bench, it's pretty much as strong as the Treaty could go. Fitzgerald has had his troops back in training quite a bit longer though. Limerick, who flew out to Mexico for a team holiday after Christmas, are a little behind in their prep. They can expect a good welcome down at Wexford Park. Kilkenny host Cork in the other 1A clash, the latter restlessly waiting for the opportunity to shake off last summer's painful All-Ireland semi-final loss. "You can gain a bit of form and maybe find a couple of players and bring it on to get that consistency, bring that in to the Championship," siad Rebel County midfielder Bill Cooper during the week. "That’s what happened us in 2015, 2016. We came out on the wrong side of a few results early on in the year and then it’s very hard to turn it around." With no promotion on offer, 1B is all about preservation. Obviously nobody wants to drop out of the top 12, and Waterford, Galway and Dublin will all fancy throwing their weight around. Eddie Brennan is now in the hot seat at Laois and aiming to bloody the nose of the big guns. "It’s a very difficult group and we have two huge tasks at the very start, you are not going to come out and make foolish statements about what you expect from those matches," the Kilkenny man said. "We have a game plan in mind, we have certain things we worked on in training, we have to carry those into the matches, we have to believe that and you are embracing the challenge that you have and you have to believe." The ferocity of the round-robin provincial structure - and timing of the Fitzgibbon Cup games, vociferously criticised by Brian Cody and Déise boss Padraic fanning in recent weeks - inevitably demands rotation and careful use of resource. We should get a bit of of bang for our buck first day out though. The league has landed. Saturday: A cold, windy day. Rain will be widespread in the morning, heavy and persistent in places. More showery in the afternoon, with a few bright or short sunny spells. The showers will be heaviest and most frequent in the western half of the country, with a risk of hail and thunder. Mild to start, but getting colder later, with top afternoon temperatures of 6 to 8 C.
Sunday: It'll start windy with ongoing strong and gusty northwest winds. Most places will be dry with sunny spells. However, showers will affect Atlantic coastal areas and some will be of hail. Afternoon temperatures of 5 to 8 degrees with an added wind chill.